If you are an avid golfer, you have likely heard almost every recommendation about your golf swing, right? Some of these recommendations though are worth repeating. Why? Well, if they work, why wouldn’t you want to be reminded of them? The more you hear something, the better for you to understand and continue to use the information to improve your golf swing. Below, you will find some of the recommendations known by the best golfers in the game. If you find it a challenge to position yourself behind the ball while swinging a driver, try to practice early in the morning. Why? When you wake up, dew is on the grass and for some reason; you will see an improvement on wet grass. Place your club approximately two feet or more on your normal arc path. Keep it right there and then try to sweep up as much dew off the grass, sending it toward the golf fairway. From this one golf club movement, you will learn to extend your arms and your weight will be left behind the golf ball. Prior to teeing off the next time, do this exercise at least five times. You will be surprised how helpful it is to your golf game. As it relates to shorter shots, one of the most neglected facets is the golf ball’s trajectory when you hit it. So many individuals are of the assumption that to be successful at chipping, the ball has to go in the air. They also think that pitching means you hit shots that are close to the ground. These are both wrong. The appropriate way to hit the chip is to keep the idea of hitting the ball in the air at the back of your mind. The chip should be kept as low as you can. Use the Rope It Golf Training balls to help you practice. You want to make sure that when you hit the chips, it stays under the rope. The more that you practice, the easier it will get. On the other hand, you can allow the ball to rise up when you hit pitch shots. 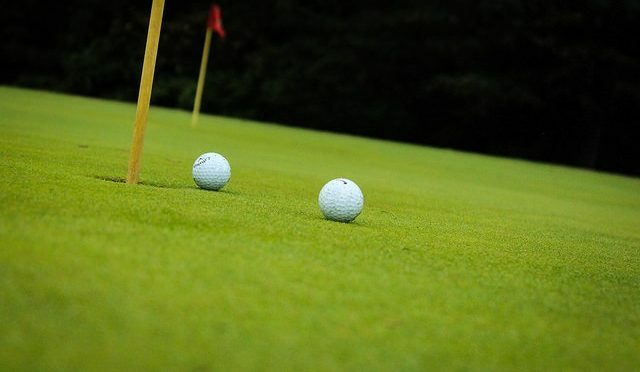 Be sure to rise up the rope found on the Rope It Golf Training ball over a high object such as a goal post, for example, while you practice hitting pitch shots higher. Make sure your wrist is relaxed, releasing all the way through the golf ball. If you want to get serious about your golf swing, it is best to get a pack of Rope It golf training balls. You can even practice in your backyard without disturbing anyone. Get up to par on you pitch, chip and swing by going to That Training Ball for the proven Rope It golf training balls. Previous PostHelp Your Golf Game with Training AidsNext PostGolf Training Aids: Do they Work?